Our guild co-president, Liberty Worth has asked for pillows for a charity she is putting together called The Sunny Room Pillow Drive. They will be given to teens living in a shelter in Los Angeles to help add a bright note of fun to their rooms. 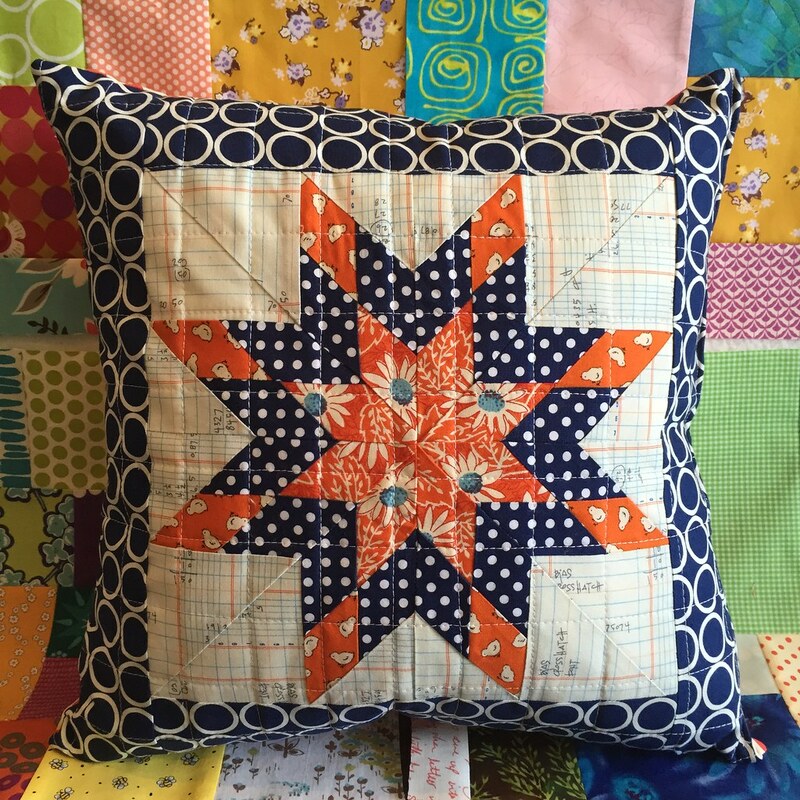 A while back I made this Lone Star block from Lynne and Kerry's book, 500 Quilt Blocks. It was originally planned for Elisabeth's comfort quilt, after the loss of her beloved dog, Wallace. I obviously did something wrong, because my block turned out to measure 10-1/2" square instead of 9-1/2". It promptly went in the orphan block pile, but I knew it was destined for greater things soon. This week I added the border to it and the backing and made it into a 16" pillow. No zippers, as required, just sewn together on all four sides made a quick and easy finish. I didn't make it to the LAMQG meeting last week. I missed our very special guest, Carolyn Freidlander. I hear she did a wonderful presentation. I'm hoping to see Libby in the next month or for sure at the next meeting, where I can deliver the pillow. Another delightful make Di! I do love orange and this reminds me why I should be using it more! such of pretty combo of lovely fabrics - sweet! Too bad you missed Carolyn F. Maybe another time!